The New Humanitarian | Refugee versus migrant: time for a new label? Refugees and migrants have been making the headlines like never before in recent months. With the start of Refugee Week today, culminating in World Refugee Day on Saturday, that focus is only set to intensify. So what exactly is a refugee? How are they distinct from migrants, and why is it important? The definition spelt out by the 1951 Refugee Convention is deceptively simple: a refugee is someone who "owing to a well-founded fear of being persecuted” has fled to another country and is in need of protection. The UN’s refugee agency, UNHCR, acknowledges that since the Refugee Convention was drafted, global migration patterns have become much more complex and refugees now often travel alongside millions of so-called economic migrants. The reality is much murkier. People often move for a number of reasons that may include fear of persecution as well as wanting to find better economic opportunities, and they may move more than once, like the Syrians who initially crossed into Turkey or Jordan but are now boarding boats to Greece. In an age when neither refugees nor migrants are particularly welcome, the line between the two is increasingly blurred and the terms themselves have become politically loaded. Most of the boats now crossing the Mediterranean contain both migrants and refugees, a phenomenon that researchers refer to as “mixed migration”. However, it often serves the interests of politicians to refer to everyone crossing the Mediterranean as illegal migrants, while rights groups and activists are more likely to call them all asylum-seekers or refugees. Melissa Phillips, a researcher at the University of Melbourne, has pointed out that such distinctions matter because migrants are generally viewed as much less deserving of our sympathy and support than refugees. “It is time we stopped talking solely about migrants and start to use more technically accurate and relevant labels,” she writes. The problem is that the labels themselves no longer seem adequate to encompass people who migrate willingly, those who flee for their lives, and the whole spectrum of forced displacement and self-determination that falls in between. International refugee law experts tend to agree that someone becomes a refugee the moment they have to flee their country, even if they are not recognised as such until they seek asylum in a host country. In trying to reach that country, they may be forced to travel as undocumented migrants, crossing borders clandestinely, often relying on smugglers. “When people are on the move, they can only be described as migrants or asylum-seekers,” said Chris Horwood, coordinator of the Nairobi-based Regional Mixed Migration Secretariat. Even after arriving in a host country, they remain asylum-seekers until they have gone through a process of refugee status adjudication that is supposed to determine whether or not they are really in need of international protection. While failed asylum-seekers may still consider themselves refugees, the state that rejected them now considers them an irregular migrant who must either leave the country or be forced to leave. The problem of “asylum shopping” has come about because asylum systems vary considerably from one country to the next. So while Norway granted asylum to 95 percent of Eritreans who applied there last year, France only granted asylum to about 15 percent. Unsurprisingly, asylum-seekers gravitate to the countries where they have the best chance of being granted refugee status. We have to remember that until there is a fair procedure conducted for each person, we really don't know if the person is a refugee or not. “We have to remember that until there is a fair procedure conducted for each person, we really don’t know if the person is a refugee or not,” commented Michael Kagan, co-director of the Immigration Clinic at the University of Nevada. Only in situations where there are mass movements of refugees – usually as a result of war – and no need or capacity to do individual refugee status determinations, do host governments sometimes make the decision to recognise all new arrivals from that country as “prima facie” refugees. Migrants or refugees or both? When commentators do attempt to distinguish between the different groups currently trying to cross the Mediterranean on smugglers’ boats, they tend to designate Syrians and Eritreans as the bona fide asylum-seekers, while the many West Africans arriving in southern Italy are all lumped together as “economic migrants”. Similarly, most international attention on the recent crisis in Southeast Asia focused on the Rohingya, a persecuted minority from Myanmar, while the many Bangladeshis who also boarded smugglers’ boats were dismissed as economic migrants. He noted that many West Africans have experienced violence and repression in countries such as The Gambia, Mali and Nigeria before going to Libya, where arbitrary detention and violence targeting foreigners forced them to flee again. More than 1,100 migrants and asylum seekers came ashore on the Malaysian island of Langkawi after being abandoned by their smugglers. They are being held at two temporary holding centres prior to be transferred to detention facilities on the mainland. 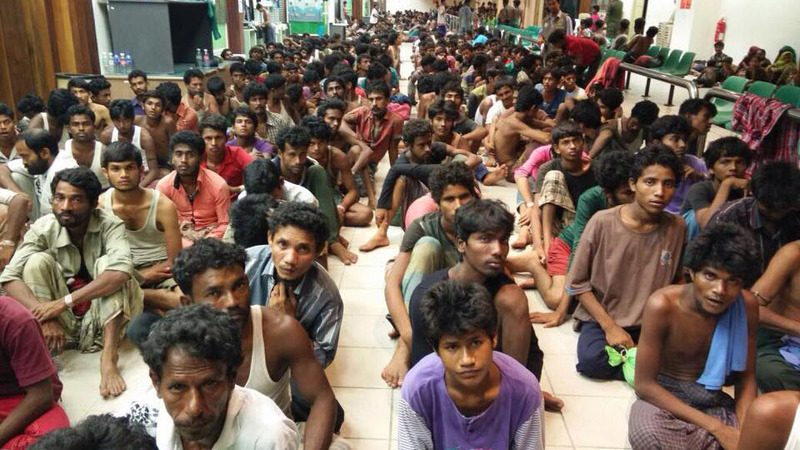 Survivors from an abandoned smugglers' boat that came ashore on the Malaysian island of Langkawi included Rohingya asylum seekers and Bangladeshi migrants. The term “forced migrants” is sometimes used, mainly by academics, to acknowledge the many people who migrate unwillingly but don’t fall under the Refugee Convention’s technical definition of a refugee and are therefore not entitled to international protection. This would include people who have abandoned their homes and countries because of drought or some other natural disaster. “Public policy relies on the myth of clearly distinguishable categories,” commented Loren Landau at the African Centre for Migration & Society at the University of Witwatersrand in Johannesburg. He added that to say this publicly had become increasingly difficult as it was viewed as giving ammunition to those who would like to place more limits on asylum.